We have spent over 10,000 hours underwater, dived with dangerous sharks, sea snakes, box jellies, strong currents and zero visibility, all in complete safety. Except for one dive on my 49th birthday. My 49th birthday, on the 23rd Feb 1996, was certainly one I won’t forget in a hurry. I was attacked by a crocodile while working on a fringing reef off Cape Flattery! Yes, you read that right, a croc between 3 and 4 metres long came up behind me and latched onto my foot while I was doing coral surveys in about 5 metres of water on the outer edge of a reef about half a kilometre offshore. The water was so dirty that at first I couldn’t see what it was attached to my foot and thought that a grouper had grabbed me. Then it swam forward and I folded up over a large croc head with sharp toothed jaws clamped across my foot. The staring yellow eyes sent a jolt of horror to my very core. I must admit that in that moment, as it shook me around and I banged to and fro against its scaly side I thought that my last transect had been swum. The croc swam with me up to the surface and I yelled at Avril, who was boat person that day, to bring the boat over. I then made a conscious decision that I had to fight to get away. What else could I do apart from lie down and weep! 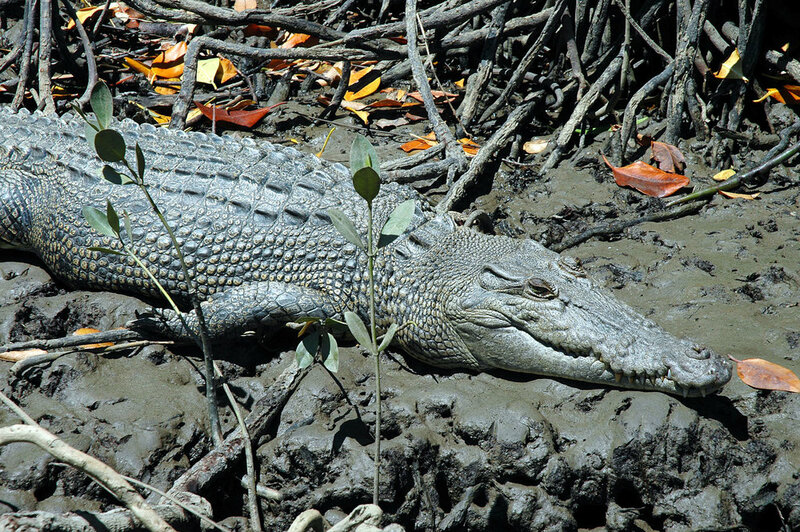 I grabbed the croc around the neck and started bashing its eyes with the sharp tip of my spare survey tape. After a bit of this it took another bite and swam off down with me, with more shaking and rolling. In this confusion I lost my tape and ended up lying alongside the croc, so I grabbed it around the middle and punched its back: too hard, and then its belly. Nothing happened so I grabbed its front legs and wrenched them repeatedly up over its back as hard as I could in a sort of croc arm lock. After a bit of this and lots of swearing from me, the croc finally decided it’d bitten off more than it could chew, let me go, and departed in a great buffeting rush. Avril meanwhile had seen me on the surface and had realised what was going on when she saw the croc’s head holding onto my foot. Utterly horrified, she tried to get the boat as close as possible but we disappeared again. When I popped up free, the boat was only ten metres or so away and I managed a very rapid exit indeed in spite of a mashed foot. Then we had to get Warren, my buddy diver, out of the water. He had been nonchalantly waiting at the end of the transect and had no idea of all the drama, even though he had only been a few metres from me when the croc attacked. Eventually with much motor revving and banging he appeared and was exhorted to get into the boat with great haste. Rarely have I seen anyone move so fast - our faces must have told him it was urgent. As I subsided to the deck Warren took the helm and drove at full speed back to Lizard Island which had been our base for this project. Once safely back at the Marine Lab they took great delight in cutting me out of my bootie and wetsuit. This was the first use of the special wetsuit removing scissors the lab has had for years! Although it was really sore, the foot didn’t look too bad at this stage, only six torn puncture marks on the upper side of my foot, minimal bleeding and a bit of swelling. However, the flying doctor, consulted by radio, suggested a trip to Cairns Base Hospital. By the time of the flight a few hours later the pain had really set in and I was only too glad to go. Later that night, after X-rays revealed broken metatarsals, and lots of ohs and ahs from nurses and doctors, they cut all the wounds open, joined the dots as the surgeon put it, cleaned them out and wrapped my poor damaged foot securely in bandages. I then had to endure five days in hospital being pumped full of antibiotics while they waited to see if serious infection set in. All previous croc bites that are on record have become infected and taken months to heal in spite of antibiotic treatment. For some reason, maybe all the good vitamins and potions Avril fed me in hospital and afterwards, the wounds remained clean and were sewn up with about 26 stitches six days after the attack. I then managed to persuade the doctors to let me go home, where I lay around for a week or two healing. The wounds healed well with no sign of infection although I had to walk with crutches for several weeks. The extreme crushing of those croc bites badly bruised and traumatised my foot and it took the best part of a year before I could walk and run as normal without my foot swelling up. Remarkably, the ragged punctures all missed the major nerves, arteries and tendons in my foot, in some cases by mere millimetres, and there was no permanent damage. All in all I was extremely lucky, and coped remarkable well mentally as well, getting back in the water only five weeks after the attack. I’ll certainly remember that birthday! This crocodile is about the size of the one that bit me - somewhere around three and a half metres long.